Want to get in on the boozy advent calendar fun but not a wine drinker? 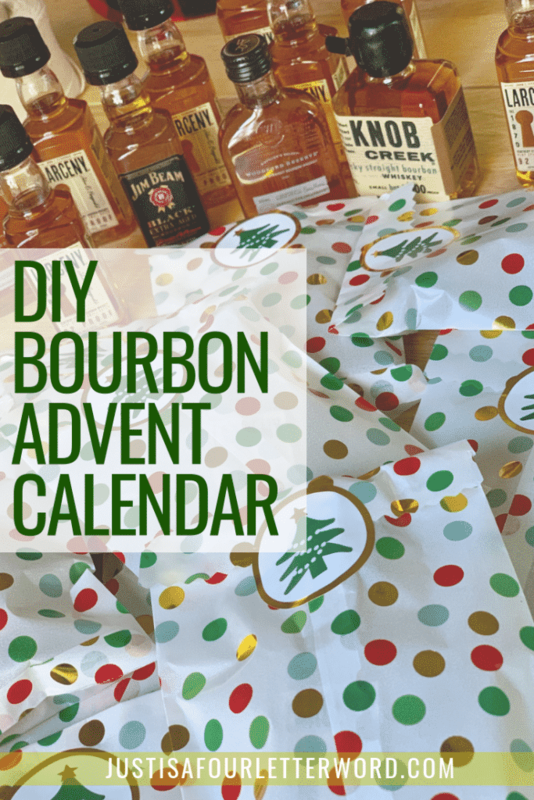 Make this bourbon advent calendar instead! This might be the easiest and possibly the most delicious holiday treat you can make this year. Counting down to Christmas is a holiday in itself. In the past few years, I’ve seen toy and candy countdowns, even 12 days of socks! I decided it’s time for the adults to have a little fun and I know just the thing to make it happen! 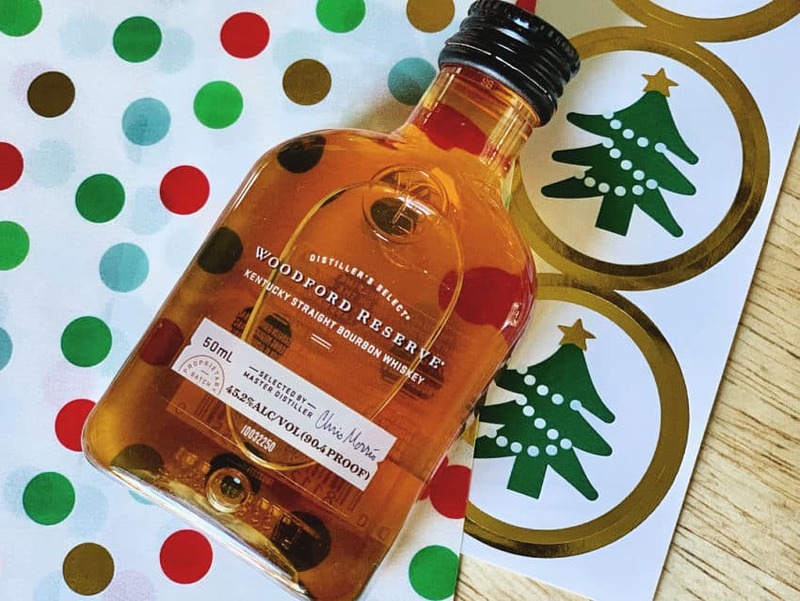 The best part about making your own bourbon advent calendar is that you can customize the bourbon with your favorites. Or maybe you want a variety of liquor and don’t want to stick to just bourbon. I won’t judge. If you’re looking for a wine advent calendar, I have that too! 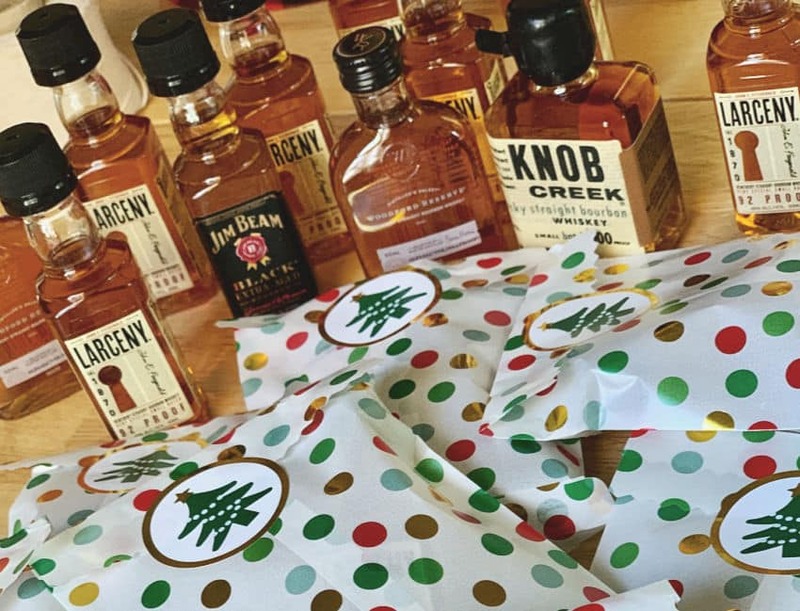 Making a bourbon advent calendar is super easy and fun. No matter what alcohol you or your giftee enjoys, it’s a great way to customize a fun countdown all the grownups can enjoy. Sure it’s a little more work to make your own instead of buying a big bottle, but it’s fun! And no, you don’t have to drink one each day. In fact I hope you will drink responsibly and add some fun to your liquor cabinet. I didn’t want to get too crazy with the packaging. 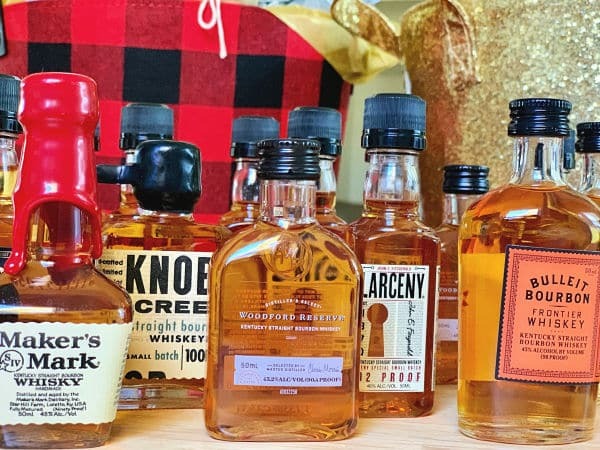 After all, a bourbon advent calendar is all about the bourbon. 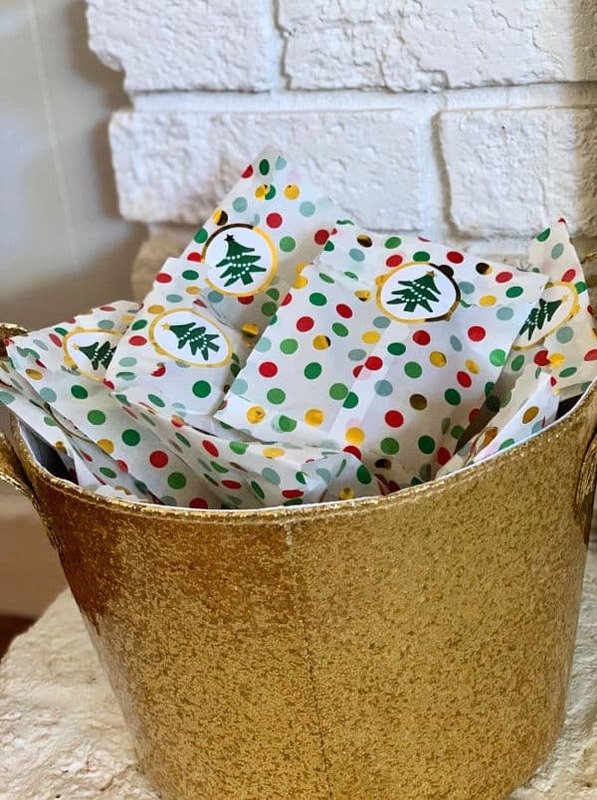 Of course if you have a variety of items, it’s still fun to be surprised so I wrapped them! I found some super cute treat bags at target that came with stickers to seal them. They are the perfect size for small travel bottles of alcohol. Done! These couldn’t be easier to make. I popped one bottle in each bag, folded it over and sealed with a sticker. That’s it! I love the way they turned out and I know my husband will be too. He doesn’t know it yet, but this is an early Christmas present for him! 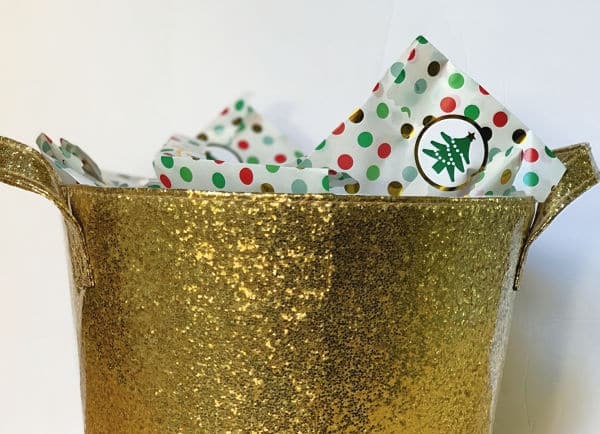 Speaking of gifts, this would make a great gift for friends or coworkers or even party favors. Customize a 12 days of Christmas option or wait til Christmas Day and swap the theme to a New Years Eve countdown! I can think of so many ways to customize these baskets. I made a wine advent calendar too, which is how I plan to count down to my favorite holiday. Cheers! I don’t even drink bourbon, but I want to make this for someone, anyway! Ha! Never too soon to try something new! Love this idea. Living in Bourbon country, with a bourbon connoisseur, I love this and I’m doing it this year! Yay!! I hope you share the finished product! Yes to this!!!! I will be making this happen for my bourbon connoisseur! Yes!! He will love it! I may do 12 days of liqueur. Yes! I love that idea.